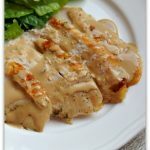 This slow cooker turkey breast is so super easy to make (it only has 3 ingredients) and turns out moist and flavorful every time. Use kitchen shears to cut off any excess skin, but leave the skin covering the breast. Rub onion soup mix all over outside of the turkey and under the skin. Place butter in bottom of slow cooker. Then place turkey breast in slow cooker* with the breast side down. Cover, and cook on low for 7 hours or until turkey breast comes to a temperature of 165 degrees. When turkey is done take it out and set it on a platter. Use foil to loosely tent the turkey and let it rest for 10-15 minutes. While it is sitting use the drippings in the slow-cooker to make gravy. Pour the juices in the bottom of the slow cooker through a mesh strainer and into a saucepan. In a small bowl mix together the cornstarch and the water until smooth. Add the cornstarch mixture into the saucepan with the drippings. Whisk over medium high heat. Gravy will thicken in about 5 minutes. Salt and pepper to taste.